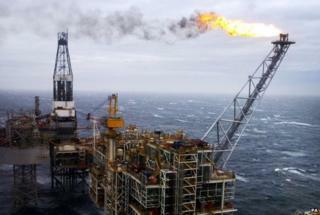 Companies in the UK oil and gas sector expect to create up to 39,000 jobs over the next two years. A survey of 100 companies, commissioned by the Bank of Scotland, found expectations of employment growth had increased since last year. A clear majority (69%) of executives in the companies were optimistic about their growth prospects in 2014/2015. A total of 38% of those responding said a shortage of skilled workers would be their greatest challenge. International expansion was cited as a priority by 64% of those taking part. Key areas for investment were Africa, North America and the Middle East. The survey found 46% of companies were already planning further growth in foreign markets over the next 24 months. The research was carried out by BDRC Continental and companies were chosen to reflect a range of size, location and service type. A similar study carried out last year indicated companies in the sector would recruit an additional 34,000 people over two years. Bank of Scotland commercial area director Stuart White, said: "The findings of this report are excellent news for the economy, demonstrating the employment-generating nature of the oil and gas industry now and in the future. "With most of the UK's oil and gas firms clustered in Aberdeen and the north-east, Scotland should reap the largest share of these new jobs, however other parts of the UK will benefit from expansion plans. "The report also highlights the growing challenges posed by the lack of a skilled workforce." Mr White said new specialist apprenticeship schemes could help address the shortfall. "The results also demonstrate the global nature of the industry as more firms look to expand internationally and tap into the markets with the largest levels of recoverable reserves," he explained. "With 44% of income already generated internationally, this is not a new trend, and reflects the reach UK firms have as the industry benefits from the expertise gained in the challenging North Sea environment." A Scottish government spokesman said: "This is an increase of 5,000 on the estimate made only last year. "It is also very encouraging to see a strengthening of the international expansion of these companies, and this is a trend which is expected to continue. "The skills and knowledge developed in Scotland as a result of the development of the North Sea are a key strength for Scotland. "We are committed to working with the oil and gas sector to maintain competitiveness, facilitate the transfer of skills and knowledge to other sectors and utilise Scottish-based skills in world markets." The Labour MP for Aberdeen North, Frank Doran, said that, while the report was good news for the industry and Scotland, there were long-term issues facing the sector, including price volatility. Speaking on BBC Radio's Good Morning Scotland programme, he questioned whether an independent Scottish government would have the expertise and resources to run the industry efficiently. "That is one of the unanswered questions - where are the civil servants going to come from?"